يشكل فندق فندق ميركيور بيرث بموقعه الممتاز في قلب مركز مدينة بيرث نقطة انطلاق ممتازة لاستكشاف برث. يمكن من هنا للضيوف الاستمتاع بسهولة الوصول إلى كل ما تقدمه هذه المدينة النابضة بالحياة. إن سهولة الوصول من الفندق إلى المعالم السياحية الشهيرة الكثيرة في المدينة كمثل Yirra Yaakin Noongar Theatre, Old Perth Fire Station, مسرح بلي هاوس هو استثنائي بحد ذاته. كما يقدم فندق ميركيور بيرث الكثير من الخدمات لإغناء رحلتك في برث. يمكن للنزلاء الاستمتاع بالميزات التالية: خدمة الغرف على مدار الساعة, خدمة التنظيف يوميًا, مجهز لذوي الإحتياجات الخاصة, مكتب الاستقبال على مدار الساعة, مرافق مخصصة لذوي الاحتياجات الخاصة أثناء إقامتهم في هذا المكان الرائع. لقد جهزت هذه الإقامة الفندقية بعناية فائقة لتوفر مستوى عالي من الراحة. في بعض الغرف يجد النزيل سجاد, بياضات, مرآة, مناشف, اتصال لاسلكي بالإنترنت. سواء كنت من محبي الرياضة أو كنت تتطلع لتفريغ عناء نهار صعب، ستجد خدمات ذات مستوى عالي بانتظارك كمثل حوض استحمام ساخن, مركز للياقة البدنية, حمام سباحة خارجي, سبا. يحظى فندق فندق ميركيور بيرث بموقع ممتاز وخدمات يصعب منافستها. Twin room is good, very spacious and comfortable. No shower hose which is quite inconvenience. Lighting is quite dark. After turning off the aircon, the room is still very cold.. The good side is that the airport bus A380 bus stand is just 2minutes walk around the corner if Irwin Road of St George Tce.. you can use the Family ticket (A12.60) during weekends on A380 (AUD4.90)as well. Great savings. Less than 30mins to T1. Location was good, within walking distance to hay Street mall, London court, the Mint and city cat (free inner city bus) bus stop just at the corner. But you do see more homeless people which makes it unsafe to walk around after dark. They scream, shout and run around the area so better be careful. The room wasn’t quite ready when we checked in, the light in the room was flashing so we had to change to another room. Tooth brush and slippers upon request. Bottle water not provided but there’s water tank in the lobby. Cleaner didn’t clean properly as we can see hair in the bathroom. Carpet and chair look tired. Overall, I can only say that you get what you paid for. The location is within walking distance to Perth CBD. Friendly staff and affordable price. The breakfast buffet is yummy especially the croissants. The toilet is abit worn, after flushing, there is water leaking from the toilet bowl. However, this is not that serious. We had a great stay. Our room was clean and comfortable despite being a tiny bit dated. Staff were professional and friendly. We’d stay here again. We had a good stay at the hotel- it is well located with one of the pickup points of the city tour very closeby and also close to some nice shopping areas. Room was spacious - adequate for a short stay with 2 young children. 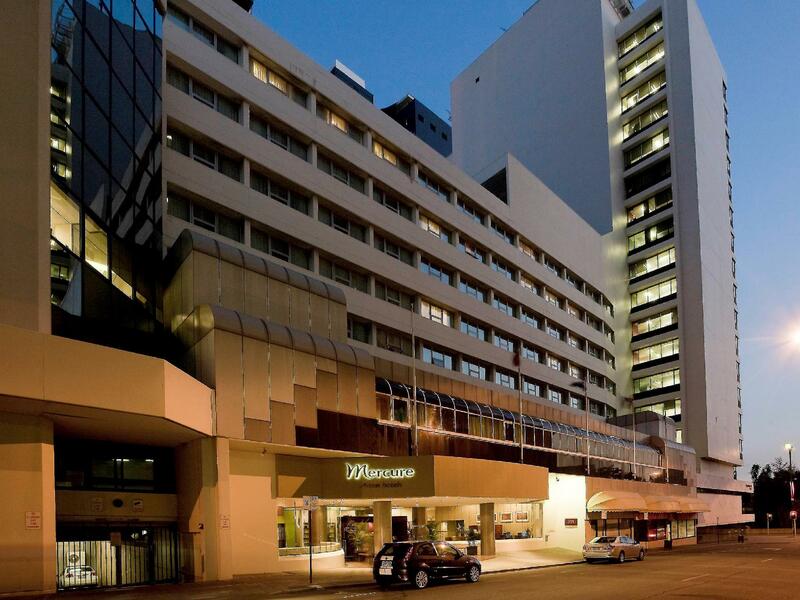 Mercure is located right on Hay Street in Perth CBD. There were quite a few restaurants nearby that are open late. As of end of 2016, there is a construction site right across for a new westin hotel. Nearby there is a City of Perth Parking lot which makes it easy to park overnight. Hotel will charge 25 AUD for 24 hours. Hotel generally in good shape. Staff were very helpful. Good cleanliness. We were traveling with 2 young children. Guest Laundry had 2 washers, 2 dryers. But half were broken. overall good experience. Breakfast was good. the hotel, is a bit run down. Thermostat was not working properly. Staff service was great, provided a portable heater. The lock on the door was faulty, there was no inner lock. Location was the best, really central. Definitely would go there again. Great central location to explore the CBD, Elizabeth Quays and Stirling Gardens. Weather was perfect and the hotel was lovely. Downstairs bar had great food and drinks, reception staff were very professional. The only things I could fault were that the rooftop heated pool wasn't warm enough to swim in and the spa had so much chlorine it stung our eyes and we didn't last 4 minutes. We had a room that had noise from a party suite and rang reception 4 times during Saturday night and early hours of Sunday morning. Each time they dealt with it and I believe it was just a schoolies thing. Staff were great. The hotel is located in the heart of the City, it is perfectly placed to enjoy all the shopping. Besides, it is only 10 minutes walk from the beach. There are a lot of cafe nearby this hotel. Hotel staffs are friendly and helpful. The hotel is well situation in the middle of the city area with food and shops just few minutes walk away. As it does not have centralized parking just outside the hotel, will have to park along roadside somewhere near to hotel which can be a problem if one is not available...generally okay. Hotel was perfect, location excellent and bed so comfy and big. Couldn't fault this hotel would stay again if ever in Perth. Pool on rooftop was great didn't eat at hotel so can't comment on food. Breakfast offered normally $32 but was offered for $20 a head went to Cafes each morning for half the price! The staff, location and the staff. I was so impressed with the service I received. I arrived at night with a sleeping 3 year old in my arms. The staff without being asked unpacked my car, parked my car in the car park and carried my bags up to the room. I was super impressed with this service as traveling by yourself with a young child can be difficult at times. This hotel is specially well located. It's very easy to get into the city center and to take any of the free buses available in Perth. It's 10 mn walking to the ferry boats to the Zoo and 10 mn to the train station to Fremantle too. The breakfast was normal and they offer 3 different options/prices according to what you want to eat. The location of the toilet paper (under vanity bench) in queen bathrooms created some confusion - maybe guests should be advised. Care needed stepping in and out of the shower, due to high sides of bath. Service of staff was friendly, polite and very professional. Food was enjoyable. Level of cleanliness satisfactory. Walking distance to attraction and shopping mall. Friendly staff allowing earlier checkin. But was strict on check out time at 12 pm. Comfortable bed(two double beds) and room. Reasonably priced. Recommended. Great location, good value and excellent service. the toilet is not provided with toilet paper but tissue, which i've never experienced. in my memory, mercure is a very decent and grand hotel, but not for this. overall is average.